Six states issued termination orders following law and order crises in the past fortnight, but only two followed the 2017 rules. In the past fortnight, six states have used internet shutdowns to control law and order crises. They are West Bengal, Jammu and Kashmir, Uttar Pradesh, Madhya Pradesh, Punjab and Rajasthan. But of these, only two states – Madhya Pradesh and Punjab – followed the procedure laid down in rules notified by the Centre in 2017. While there was communal tension in West Bengal following clashes during Ram Navami celebrations, large-scale security operations against militants in Kashmir on Sunday put the Valley on the boil. A day later, a Bharat Bandh called by Dalit organisations to protest a Supreme Court order on the Scheduled Castes and Scheduled Tribes (Prevention of Atrocities) Act, which they alleged diluted the law, turned violent, leaving nine dead and disrupting normal life in parts of Madhya Pradesh, Punjab, Uttar Pradesh and Rajasthan. Apart from imposing the standard prohibitory orders, such as restrictions on the movement and assembly of people, the administration in each of these states limited or blocked internet services in affected areas. 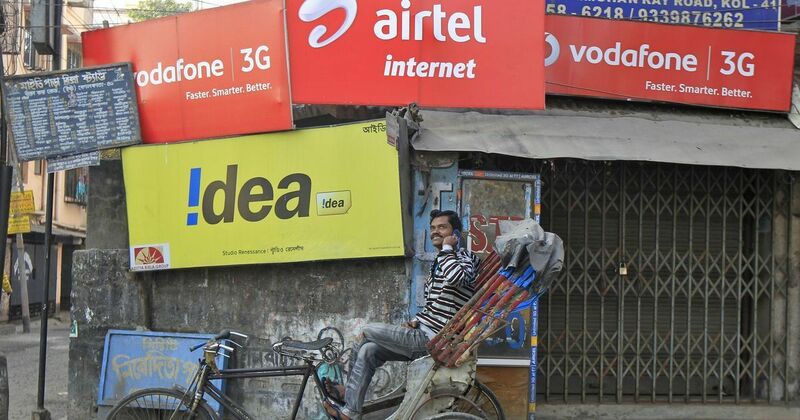 Internet shutdowns have become par for the course in India in situations like these. According to a tracker maintained by the Delhi-based non-profit Software Freedom Law Centre, there have been 161 instances of internet shutdowns in the country since 2012. A bulk of these have been in the last few years. In 2016, there were 31 shutdowns; in 2017, there were 70. This year, the number till the afternoon of April 5 stood at 32. These numbers are among the highest in the world. Local administrations maintain the internet is often used to spread rumours and instigate violence. Hence, short-term suspension of services in times of law and order crises helps keep the situation under control. But India’s high rate of internet shutdowns has often been criticised by human rights groups and press freedom organisations on the grounds that they violate press freedom and infringe upon human rights. There are also economic costs to these outages. A report by the think-tank Brookings India said that in 2016, India lost close to Rs 6,000 crore as a result of internet bans. 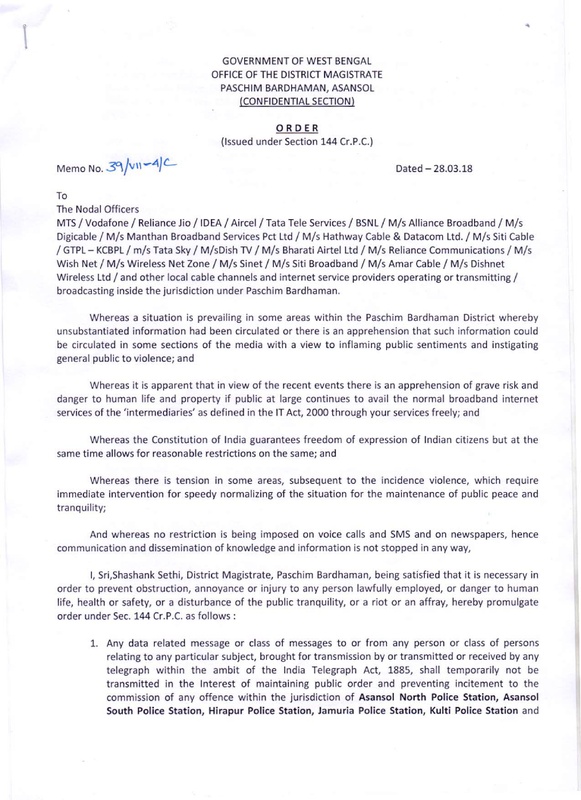 Ostensibly responding to some of these concerns, the Central government in September came up with rules to legislate the authority required and procedures to be followed to “temporarily suspend telecom services” in case of “public emergency or public safety”. Issued by the Ministry of Communications under the Indian Telegraph Act, 1885, these rules were codified as the Temporary Suspension of Telecom Services (Public Emergency or Public Safety) Rules, 2017. These rules confer the status of competent authority on the Union home secretary when the order is issued by the government of India. For a state government, the power lies with the state home secretary. In “unavoidable circumstances”, though, orders could be issued by an officer “not below the rank of a joint secretary to the government of India, who has been duly authorised by the Union home secretary or the state home secretary”. But many have expressed concerns about these rules too, claiming that they lack clarity and were passed without public consultation. The United States-based Committee to Protect Journalists called the rules arbitrary and a “severe form of censorship that deprives journalists of a key platform for gathering and disseminating news, and the country’s citizens of vital access to news and information”. Yet, an examination of the official orders notifying recent internet shutdowns suggests that most states do not follow these rules. 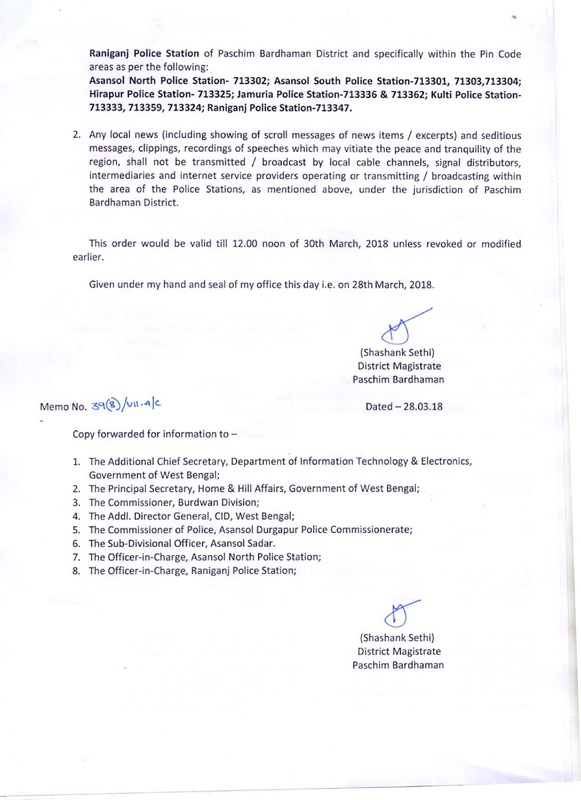 In West Bengal’s violence-hit Paschim Bardhaman district, mobile internet and broadband services were completely terminated from March 28 to March 30 mid-day. The order, which covered local cable television news channels, was passed by the district magistrate under Section 144 of the Code of Criminal Procedure. This provision gives district magistrates wide-ranging powers to pass orders to maintain public order. Most internet termination orders in India flowed from this provision prior to the temporary internet suspension rules framed last year. The practice seems to still continue. “While the Constitution of India guarantees the freedom of expression of Indian citizens but at the same time it allows for reasonable restrictions on the same. 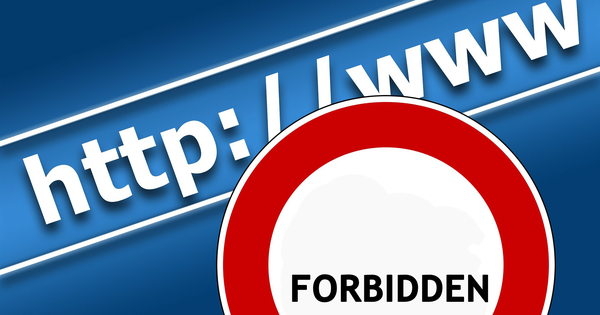 Paschim Bardhaman district magistrate Shashank Sethi said his orders did not contravene the Centre’s rules mandating the procedure to temporarily disconnect internet services. “It was done with the approval of the home secretary and later it was extended by the home secretary himself,” said Sethi. 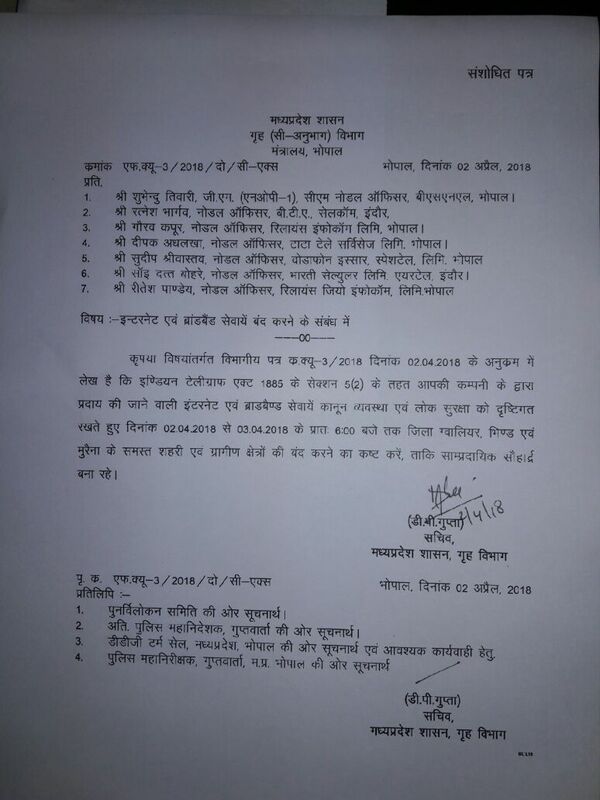 In Uttar Pradesh’s Meerut district, where mobile internet services were blocked from April 2 to April 3 in the wake of protests by Dalit groups that turned violent, the termination order was again issued by the district magistrate under Section 144 of the Code of Criminal Procedure. The order stated that due to the “unavailability of time”, the decision was taken unilaterally without giving a hearing to other involved parties. The order makes no mention of the new temporary suspension rules. The temporary suspension rules of 2017 allow for an officer authorised by the state home secretary to pass internet shutdown orders, “subject to the confirmation from the competent authority within 24 hours of issuing such order”. However, the rules state that the officer passing the order should not be below the rank of joint commissioner to the Central government. A district magistrate is on par with a deputy secretary-level officer of the Central government, a rank three notches below joint secretary in the bureaucratic hierarchy. 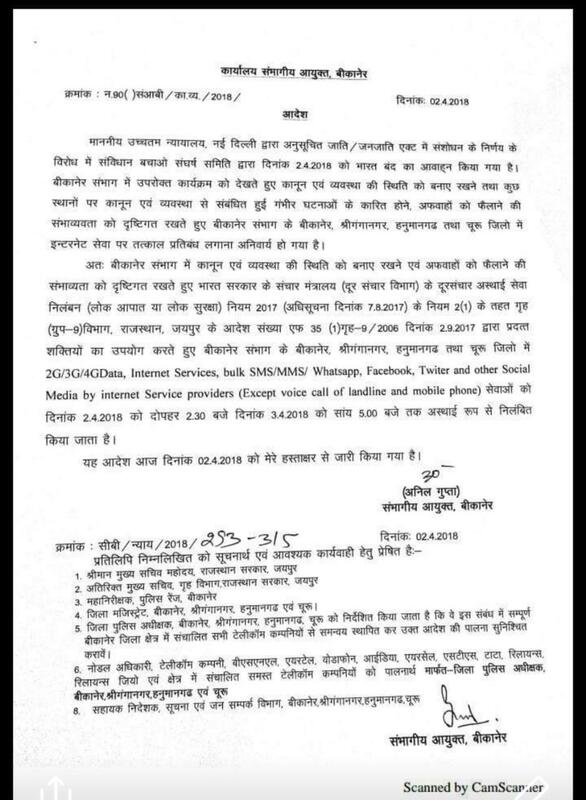 In Rajasthan, where several districts were impacted by the same protests, orders to terminate mobile internet services were issued by divisional commissioners under the 2017 rules. 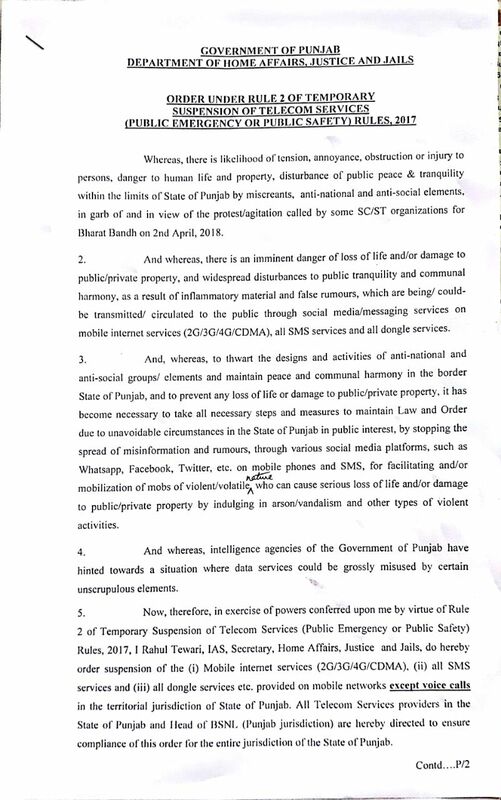 The order invoked the powers authorised by the state’s home department to divisional commissioners in accordance with the temporary suspension rules of 2017 to suspend mobile internet services from the afternoon of April 2 till the next evening. Some districts in the state also passed their own orders. 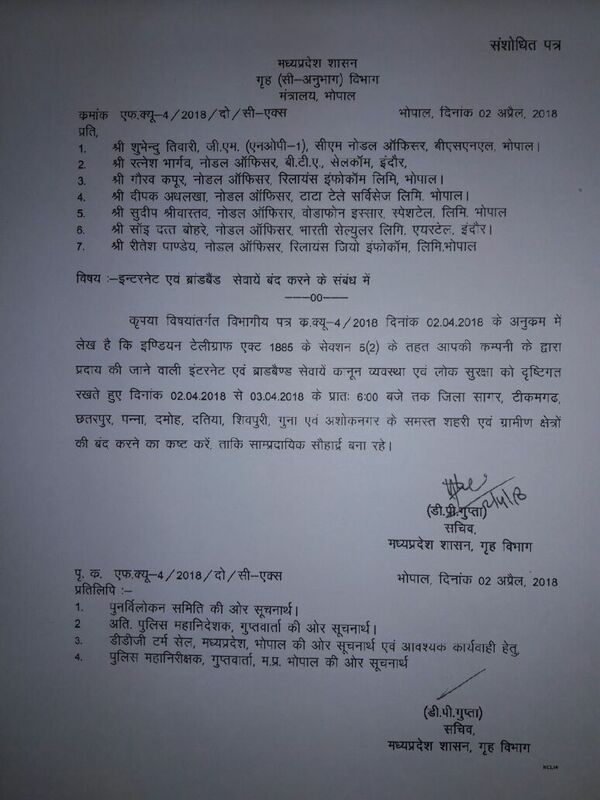 In Barmer, the district magistrate, Nakate Shivprasad Madan, ordered for mobile internet services to be terminated under Section 144 of the Code of Criminal Procedure. 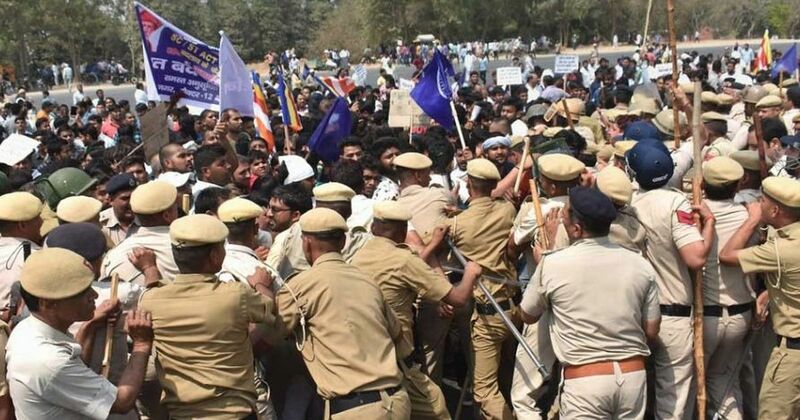 However, Punjab and Madhya Pradesh – the other two states where Dalit protests turned violent – followed the template of the 2017 rules. 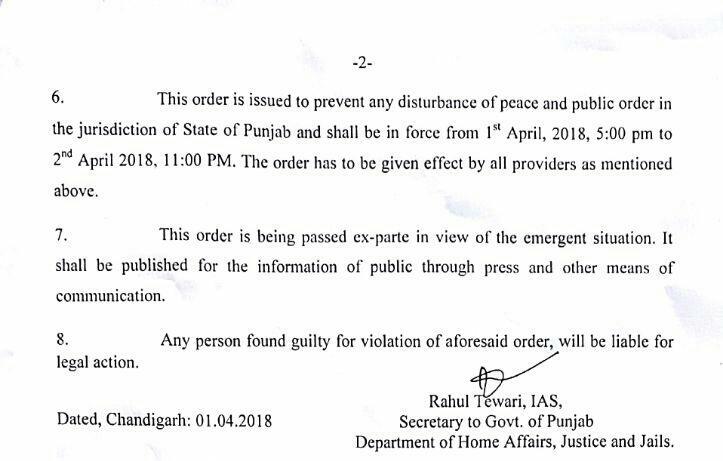 Punjab suspended mobile internet services from April 1 till the next evening. The order, issued by the state’s home secretary, stated that intelligence agencies “hinted towards a situation where data services could be grossly misused by certain unscrupulous elements”. 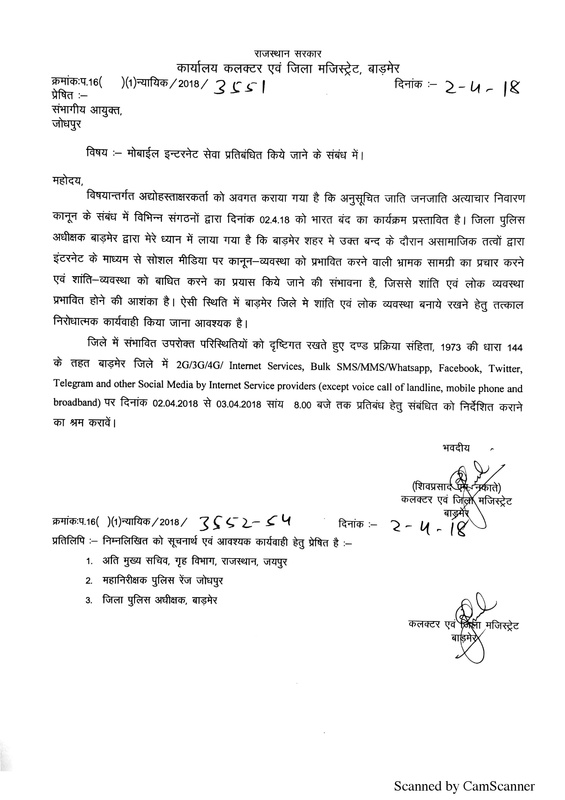 In Madhya Pradesh, there was total shutdown of internet services in four districts for a day. All orders were passed by the state’s home secretary. Fearing law and order trouble, the administration in Kashmir blocked mobile internet services for more than two days in at least four districts. According to a telecom company executive, this was done on verbal orders received from the office of the inspector general of the state police. Scroll.in could not independently confirm this. Multiple attempts to contact the inspector general’s office proved futile. With 72 internet shutdowns since 2012, Jammu and Kashmir accounts for nearly half of India’s internet outages. In 2016, the Kashmir Valley had no access to mobile internet for about four months. A right to information query yielded no clear answer on who ordered these shutdowns with the state’s civil administration claiming it had no hand.